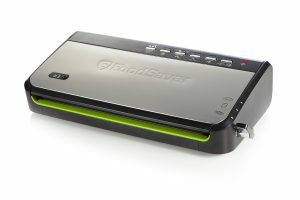 The FoodSaver® FFS005X Stainless Steel Vacuum Sealing System keeps food fresh for up to five times longer. Its automatic vacuum & seal operation allows you to vacuum seal food in compatible bags and containers. 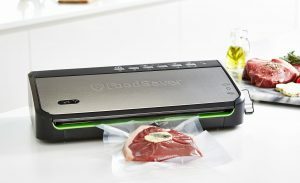 Featuring roll storage, a “Moist/dry” function for adjusting the seal according to the food consistency, variable speed and pulse functions; this FoodSaver® Vacuum Sealing System offers you ultimate control. Food is only as good as it is fresh and by taking air out and sealing flavour in with the FoodSaver® System, you can confidently nourish the ones you love. 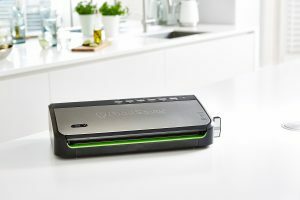 FoodSaver® vacuum sealing systems preserve the freshness and nourishing qualities of your food, reduce waste and help you lower your weekly food budget. 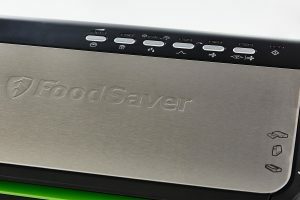 By using the tightest possible seals to prevent air and moisture from getting to your food, the FoodSaver system prevents freezer burn while locking in nutrients, taste and freshness up to five times longer than traditional storage methods. 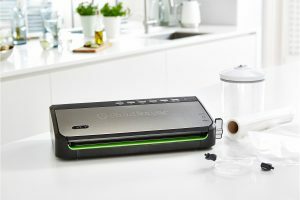 The FoodSaver® FFS005X Vacuum Sealing System features vertical storage; it is a stylish space-saving unit suitable for all sized kitchens. With one touch vacuum & seal operation the FoodSaver® FFS005X vacuum sealing system is so simple to use. 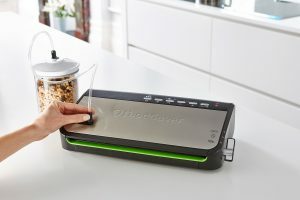 Simply feed your bag of food into the drip tray inside your FoodSaver® unit and close using the simple lock & latch mechanism. At the touch of a button the machine will automatically remove the air from your bag – progress lights inform you once a vacuum has been created. Once all air is removed the machine will then heat seal the bag, locking in freshness. 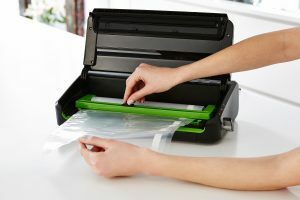 Use the accessory port with the included hose to vacuum seal FoodSaver® accessories such as the included container, the Canister mode is great for food storage. Integrated roll storage and cutting facility allows you to cut and heat seal FoodSaver® rolls to make bags using the “seal only” function. The Pulse function is great for vacuum sealing delicate items without damage while the Variable speed function offers you ultimate control over the vacuum sealing process. There is also a moist/dry food setting that allows you to adjust the seal level for different types of food. The dishwasher safe drip tray will collect any excess liquid when you vacuum seal your food. FoodSaver® bags and rolls are safe to freeze, simmer or microwave. 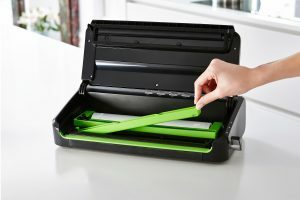 They are constructed from strong 5-ply material with special channels designed to enable complete removal of air, meaning there is none trapped in ‘pockets’ around the food that can contribute towards freezer burn and compromise freshness. All FoodSaver® bags and rolls are BPA-free – safe for all the family. 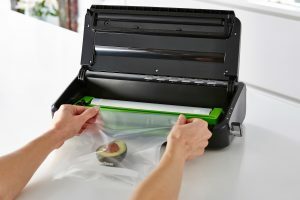 The FoodSaver® FFS005X Vacuum Sealing System includes 10 small/large size bags, 1 roll and a container to get you started.